stylos: WM 83: Ipsissima Verba or Ipsissima Vox? Today, I recorded and posted Word Magazine # 83: Ipsissima Verba or Ipsissima Vox? You can listen here. I’ve been wanting to do a follow up response to this idea of the verba/vox distinction and related issues, like whether Jesus spoke Greek or only Aramaic. So, I want to look at four sources I’ve recently reviewed on these topics, along with some final thoughts conclusions on how believers are to understand the use of modern historical-critical methodology in Biblical criticism. First: Irving Hexham, Understanding World Religions: An Interdisciplinary Approach (Zondervan, 2011). A few weeks ago, I noted Irving Hexham’s questions about whether Jesus spoke Aramaic or Greek. See my post here. Hexham suggests that the consensus among modern NT scholars that Jesus spoke Aramaic rather than Greek only came about in the eighteenth century with the rise of source criticism and subtly undermined the traditional view that the Gospels faithfully recorded the exact words of Jesus. Second: Paul D. Feinberg, “The Meaning of Inerrancy,” in Norman L. Geiser, Ed. Inerrancy (Zondervan, 1980): 267-304; esp. 301. This book comes from the evangelical “Battle for the Bible” period. It was written to defend inerrancy against its liberal despisers. In Feinberg’s article he attempts to define inerrancy in such a way that it might remain compatible with the challenges of the modern historical critical method. Of note is his specific discussion about whether the Gospels record the ipsissima verba (the very words) or the ipsissima vox (the very voice) of Jesus. When a New Testament writer cites the sayings of Jesus, it need not be that Jesus said those exact words. 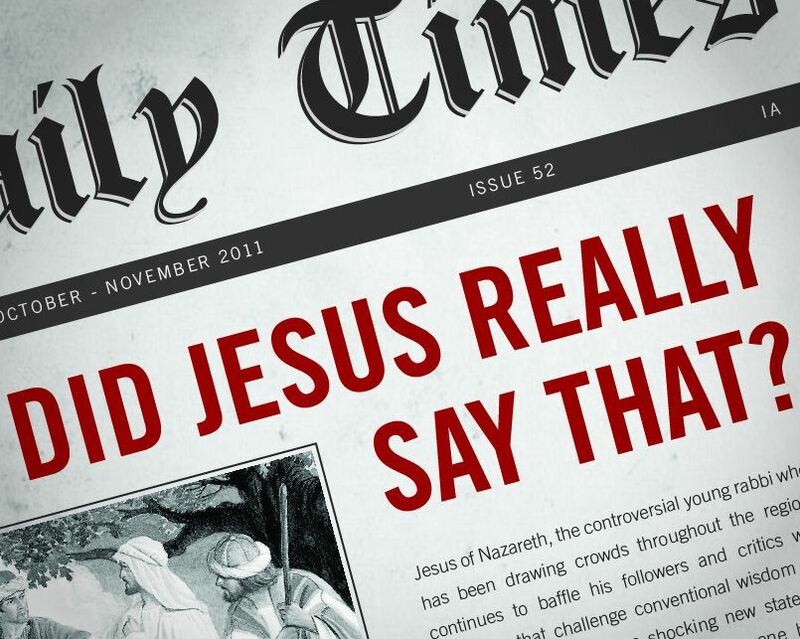 Undoubtedly, the exact words of Jesus are to be found in the New Testament, but they need not be so in every instance. My guess, however, is that most faithful, ordinary Christians (untrained in modern historical criticism) will be puzzled by this viewpoint for two reasons. First, they likely expect that the words of Jesus as recorded in the Gospels are, just that, his words, and not merely a close approximation of them. Second, they assume that distinctions between direct and indirect discourse are no harder to discern in the Greek of the New Testament than in English (or any other coherent language). So, for example, when they read John 5:8: “Jesus said unto him [i.e., the impotent man at the pool of Bethesda], Rise, take up thy bed, and walk,” they assume that this is a direct quotation, recording not merely an approximation of Jesus’ words but his exact words. If he originally spoke those words in Greek, and not Aramaic, it would, of course, require no translation. Feinberg’s analysis appears not to be aimed at that ordinary Christian reader but at the skeptic who is eager to find errors or inconsistencies in the Biblical text. He believes that by surrendering a vigorous defense of the Logia Jesu in the Gospels as Christ’s precise words, in favor of a more nuanced suggestion that such sayings might only be free renderings by the Evangelists, he has safeguarded the Scriptures against charges of errancy. But has he conceded too much? Does this not buttress the skeptic’s view that the Gospels provide an often creative and inventive account of Jesus’ life and ministry as opposed to a meticulously accurate record of his words and deeds? Furthermore, does Feinberg’s approach neglect the supernatural aspect of the faithful transmission of Scripture? Its accuracy does not, in the end, depend on the care or skill of the penmen but on the faithfulness of the God who directed them. Consider Christ’s promise to his disciples: “But the Comforter, which is the Holy Ghost, whom the Father will send in my name, he shall teach you all things, and bring all things to your remembrance, whatsoever I have said unto you” (John 14:26). Third: Darrell Bock, “The Words of Jesus in the Gospels: Live, Jive, or Memorex?” in Michael J. Wilkins and J. P. Moreland, Eds., Jesus Under Fire: Modern Scholarship Reinvents the Historical Jesus (Zondervan, 1995): 73-99. This essay appears in a volume dedicated to defending the reliability of the NT Gospels over against the hyper-skepticism of the Jesus Seminar. As with Feinberg, however, one wonders if the author does not concede too much to the Bible’s despisers. This is what the “live” approach is all about. Each evangelist retells the living and powerful words of Jesus in a fresh way for his readers, while faithfully and accurately presenting the “gist” of what Jesus said. I call this approach one that recognizes the Jesus tradition as “live” in its dynamic and quality (77). Bock then follows Feinberg by insisting on a distinction between ipsissima verba and ispissima vox. He cites one “universally recognized reality” as making the verba/vox distinction necessary: “that Jesus probably gave most of his teaching in Aramaic” while the Gospels were written in Greek, adding, “In other words, most of Jesus’ teaching in the Gospels is already a translation” (77). So, Bock concedes: “Since a translation is already present in much of the tradition, we do not have ‘his very words’ in the strictest sense of the term” (77). The best Bock can say is that the Gospels “give us the true gist of his teaching and the central thrust of his message” (78). Bock defends this view as in keeping with (1) the practices of Greco-Roman historiography; (2) the oral Jewish culture of remembering; and (3) the nature of historical writing. Regarding the third point, Bock notes: “History is not a static entity” (81). Again, it seems unlikely that the faithful Christian reader will necessarily share these assumptions. Whatever the ordinary practices of secular Greek, Roman, or Jewish authors or the customary vagaries of ancient or modern history, the believing reader sees the Bible as an extra-ordinary work. Why then, under the Spirit’s direction, should it not faithfully record the very words of Jesus? Note: When one reviews the examples cited by Bock one notices how thin are the actual citations of perceived variances in the words of Jesus among the Gospels (see pp. 84-89). Bocks gives attention to variances in the order of the temptations in the temptation narratives, perceived differences in narrative sequencing in the Synoptic Gospels, detail differences in Synoptic parallels, and differences in verbal citations (like the Father’s voice at Jesus’ baptism or Peter’s confession). When it comes to specific words from Jesus, Bock only cites two examples: (1) Jesus’ question to the disciples at Caesarea Philippi (p. 86); and (2) Jesus’ teaching on the coming of the Son of Man (p. 88). Bock concludes: “The Gospels are summaries of the teaching of Jesus,” giving the “gist” but not the exact words (89). This modern, evangelical approach was not, however, the one taken by pre-critical interpreters, who could acknowledge slight variations in the Gospels accounts while still affirming the full reliability of the Gospels in accurately recording Christ’s precise words (and those of others). How did they do this? By making reasonable harmonizations, often assuming that one Gospel writer might have recorded what Jesus (or another figure) said on one occasion or moment while another Gospel writer recorded what he said on another occasion or in another moment, thus explaining the occasional differences in wording. A report of Christ’s words might then be precise but only partial without assuming that the Evangelist had creatively summarized Christ’s words. Fourth: Robert L. Thomas, “Impact of Historical Criticism on Theology and Apologetics,” in Robert L. Thomas and F. David Farnell, Eds., The Jesus Crisis: The Inroads of Historical Criticism Into Evangelical Scholarship (Kregel, 1998): 356-377, especially 367-372. Thomas challenges the evangelical embrace of the verba/vox distinction. According to Thomas, this move “now has the evangelical world wondering what words Jesus spoke. The general impact of that field of scholarship has been on the side of assuming the gospel writers never reported His exact words or the ipsissima verba—the very words—of the Lord” (367). While conceding that Jesus’ speeches in the Gospels are shorter than the original speeches, Thomas argues that this does not mean that the words which are recorded in the Gospels are not Christ’s exact words. Thomas offers a direct challenge to Bock, in particular, including his assumption that Jesus spoke only in Aramaic and this had to be translated into Greek. He notes a “growing realization among contemporary scholars” recognizing “the wide use of Greek among the Jews of Jesus’ day,” adding, “The assumption that Jesus never spoke Greek is certainly unfounded” (368). If the Gospels do contain the very words of Jesus, what is one to make of their disagreement in wording when recording the same discourse or conversation? The fact that no single gospel records everything spoken on a given occasion furnishes an adequate response to that challenge. It is probable, in fact, that no combination of parallel accounts records the entirety of a speech or dialogue. Christ undoubtedly repeated some of His teachings with slightly differing wording on different occasions. He very probably did so on the same occasion too. So instances where parallel accounts report the same substance in slightly different forms may easily be traceable to different but similar statements on the same occasion, with each writer selecting for his account only a part of what was said (369). Thomas’ view here reflects that held by the pre-critical interpreters. Another factor overlooked by evangelicals in the whole issue of literary independence versus interdependence is the role of the Holy Spirit in enabling the memories of the eyewitnesses of Christ’s life…. The Spirit’s work in reminding and inspiring is a supernatural work, guaranteeing a degree of accuracy and precision that is without parallel in the annals of human historiography (372). In conclusion, let me share some insights from Alvin Plantinga’s Knowledge and Christian Belief (Eerdmans, 2015). This is a simplified and popular version of his Warranted Christian Belief (Oxford, 2000). Plantinga argues in that book that there is warrant or justification for Christian belief (i.e., that it is not necessarily irrational to hold Christian beliefs). At the conclusion of that book he addresses three “defeaters” (arguments against his thesis). The three are challenges based on Historical Biblical Criticism; Pluralism; and Evil. So HBC has not in general been sympathetic to traditional Christian belief; it has hardly been an encouragement to the faithful. The faithful, however, seem relatively unconcerned; they find traditional biblical commentary of great interest and importance, but the beliefs and attitudes of HBC have not seemed to filter down to them, in spite of its dominance in mainline seminaries. According to Van Harvey, “Despite decades of research, the average person tends to think of the life of Jesus in much the same terms as Christians did three centuries ago” [“New Testament Scholarship,” p. 194]. One possible reason is that there is no compelling or even reasonably decent argument for supposing that the procedures and assumptions of HBC are to be preferred, by Christians, to those of traditional Biblical commentary. A little epistemological reflection enables us to see something further: the traditional Christian has good reason to reject the skeptical claims of HBC and continue to hold traditional Christian belief despite the allegedly corrosive acids of HBC (103). I think Plantinga gets it very right here. Modern evangelical scholars have embraced and accommodated the modern historical-critical method to their reading of the Bible (in this case the Gospels) in an effort to defend the faith against objections. The problem is that these are not objections raised by the faithful but by unbelieving skeptics. The faithful, in fact, find the “new” interpretations unconvincing, at best, and undermining the faith, at worst. Jesus spoke Aramaic. That is clear from the Gospel quotations of his Aramaic speech. But it is not unreasonable to assume that he also spoke Greek and that the Gospel writers faithfully recorded his words in Greek. Not only did they rely on accurate written accounts and carefully preserved memories, but the Holy Spirit enabled faithful remembering (John 14:26). Agreements in the Gospel record do not have to explained through complex literary dependence theories. Any discrepancies in the account of speech from Jesus or other figures can also be reasonably explained through harmonization (e.g., distinctions between direct and indirect discourse, repetitions, partial citations, etc.) without abandoning confidence in the Gospels as faithfully preserving the ipsissima verba, which is essentially the default understanding of ordinary believing readers who have not been exposed to higher criticism. Very good books to study about this topic, Jeff (I disagree in special with Wallace and Bock, in some instances with Feinberg and like very much the work of Robert Thomas). The question about the exactly words of Jesus are something that I have studied since 2012, I guess. In the beggining of this year, I presented my bachelor degree thesis on the Gospel of John at the Baptist College, and one of the professors questioned my defence of the Ipisissima Verba of the words of Jesus that I defend in the majority of the occasions described in the Gospels (in particular case in John's Gospel). In my Opinion, the Gospels present the Ipsissima Verba et sinonymia of the words of Christ. A good book that deals with this and more questions surrounding the life of our Lord is "The Jesus Quest: the Danger from Within",a very good research about what's is happening in the modern evangelical academy. Unfortunatley, any attention is given to the historical critical text that followed the interpretations of a "historical-critical Jesus". Thanks for this. I appreciate very much your knowledge and your faith. VLB, thanks for the comment and insights. You'll have to tell me what the "et sinonymia" means. Yes, Thomas does a good job challenging evangelical scholarly embrace of modern historical critical methods. I also like his book on the Synoptic Gospels. The expression "ipisissima verba et synonimia" is rendering like "the same words and synonyms". So the Gospels present the same words that Jesus spoke, and in some occasions, use the same phraseology with some synonyms, but not in a way that the report of the words are more an interpretation than an accurate registration of the words. 1. So what would be the difference between synonimia and vox? 2. Do these refer to supposed translations of Jesus' words in Aramaic or the other reported speech? 3. Has anyone written about this view? Sources? 4. Can you cite a few examples from the Gospels where you think synonimia occurs? 1. Ipisissima Vox is more like the evangelists' interpretation about what Jesus said rather that the same words of Jesus, in order to correspond their theological concerns and interests (This is more often defended in the case of John's Gospel). I do not uphold that. Rather, the evangelists uses the same words of Jesus, but in some instances, there are few words that are replaced by synonyms or words of the closest meaning. The focus of the evangelists is not to give a theological interpretation of Jesus using their proper vocabulary and associated it with the Jesus's words. 2. This is not directed involved in the hypothetical words of Jesus in Aramaic, but it is more related to mental translations from the Aramaic that the evangelists could have done in some instances, it is also related to the phraseology of an eyewitness. 3. I don't know anyone that uses this kind of terminology, but you can see a very close idea in Thomas and Gundry's Harmony of the Gospels (also titled NVI Harmony of the Gospels). 4. using a simple example, you can look at Mark 6.11/Luke 9.5, the words "them" (autois and autous), "dust" (Xoun and koniorton, the latter the Av translated as "very dust" in Luke), so you have the exact words of Jesus, but with few synonyms that don't change the meaning or just interpret the sayings. OK VLB, thanks for this. My question would be, with respect, what would be the essential difference between this and the vox position. One still would be unable to discern the exact verba used by Jesus. Could such minor differences (a dative pronoun versus an accusative) be reasonably explained by variety of speech, repetition, and diversity of eyewitness reports and still maintain a strict view of ipsissima verba? I think Bock also mentioned that we can see from the Gospel writers quotation of the Old Testament. They very clearly gave the gist rather than the exact quote in many if not most instances. Vox also seems to explain the differences in recording the same events but with contradictory information, ie God’s words after His baptism, order of temptations in the wilderness etc. There does seem to be a theme of giving the gist in those instances and others. I also readily admit it’s weird and I wish there were better explanations than the ones given here.